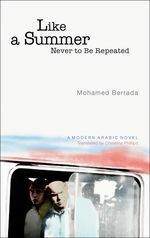 Like a Summer Never to be Repeated "Hard Cover"
Like a Summer Never to Be Repeated is a fascinating and highly experimental story based loosely around the author's own experiences in Egypt as a Moroccan student and visiting intellectual. In Cairo the narrator, Hammad, takes us on a deeply personal journey of discovery from the heady days of the 1950s and 1960s, with all the optimism and excitement surrounding Moroccan independence, Suez, and Abdel Nasser, up to the 1990s and the time of writing, revealing an individual intensely concerned with Arab life and culture. Meanwhile, his regular visits to Cairo allow us watch a culture in transition over four decades.